The first time I tried to make French onion soup, I was blinded with tears. "What kind of cook are you?” I heard the onions laughing on the cutting board. “You can't even chop an onion!" They were testing to see if my knife was sharp enough, and if my strokes were quick and even. Unfortunately, neither was true. But it was their will against mine, and I was not about to let the vegetable win. 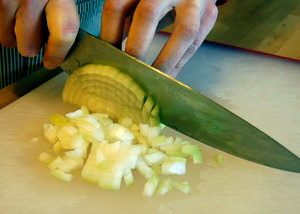 The next week, I armed myself with a real chef's knife, Jacques Pépin's book Complete Techniques, and five pounds of onions. As I worked my way through these bulbs of tear gas, I felt my strokes getting faster and more confident. Overcoming my tears, I felt united with all the cooks of the world. 2. Correct technique. 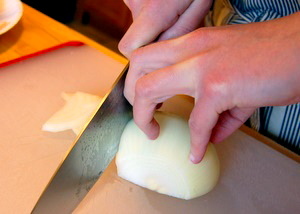 If you learn to slice and dice correctly, you’ll be able to chop so fast the onions won’t have a chance  to cozy up to your tear ducts. Since you won’t get fast overnight, I suggest practicing on fennel bulbs, as they are shaped just like onions and even have layers. 1. Cut off the top and the root ends of the onion. 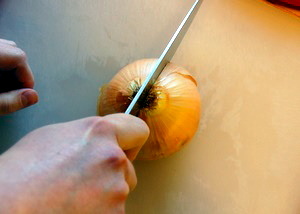 Cut the onion in half vertically and peel. 2. 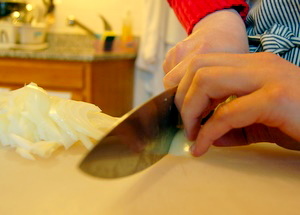 Hold a knife by placing your thumb and index fingers on the blade. 3. Place a half of the onion on your board and hold it with a claw grip. Start slicing the onion. Your slices should be parallel to the lines you see on the onion. In other words, each stroke should go through both the top and root of the onion. p(clear).4. After the first few slices, bring your claw-grip hand in contact with the side of the blade. The first knuckle on your middle finger will act as your knife guard. It should stick out and touch the knife. Scary as it seems, it will prevent you from cutting yourself. This controls the size of your slices and makes you aware of where the knife is. Keep on slicing and moving your claw grip hand gradually back. Only lift the back of the knife and keep the front attached to the board. 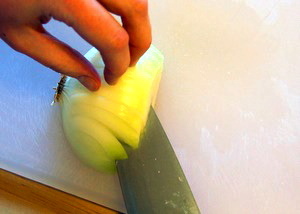 Note that your onion should be sitting towards the back of your knife. This gives you more leverage and allows you to lift the knife less. p(clear). 5. When you get close to the end, the onion will start to wobble. 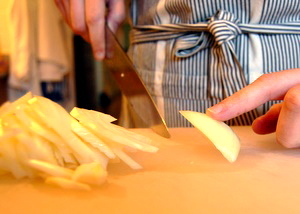 Tip it forward until the remaining onion is flat on the cutting surface and finish slicing. 1. Cut off the top end of the onion, but keep the root. This will keep the onion together as you dice. 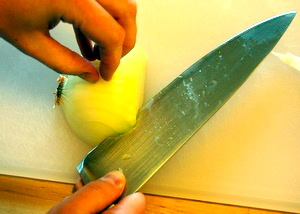 Cut the onion in half vertically and peel. p(clear).2. 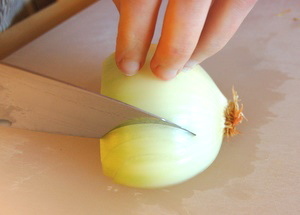 Slice the onion using the tip of your knife and keeping the slices still attached at the root. 3. Make one or two slices through the center of the onion. This one is tricky. 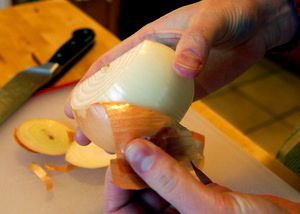 I find that it helps to place the widest part of the blade at the side of the onion closest to you and move the blade in a circular motion ending with the tip of the blade going through the onion. 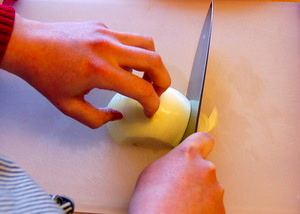 Keep your finger tips on top of the onion, so that you don’t slice through them, and remember to stop before slicing all the way through the onion. It’s better to go less deep than more deep. The goal is to keep the onion in one piece all the way until the next step. 4. 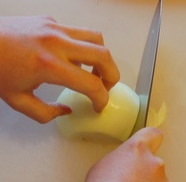 Switch to the claw grip used for slicing and slice the onion perpendicular to the direction of the cuts you made in step 2. This last step is exactly the same as the first technique of slicing an onion. The only difference is the onion’s orientation. Chop safely, and cry no more. Also on Culinate: more on the humble onion. p(bio clear). Culinate columnist Helen Rennie* is a food writer (check out her blog) and cooking teacher living in Boston.